South Austin Foodie: Honeycrisps in the house! If you've never had the perfect lightly sweet but not too tart apple, now's your chance! Central Market has gotten their first shipment of honeycrisp apples in. They're organic, grown in California, and currently $3.49/lb. Yes, that's a lot for an apple, but I can guarantee it will be the best apple you've ever had! Many apples, like Granny Smith's (a favorite of mine for making pies -- good crisp texture and great tartness), are available year round. HC's are not.... they are a fall-only apple. A cross between Macoun and Honeygold apples, developed in the 1960s, they have a fantastic firm texture, and a great snap to them. Look for them! Often grown in CA, MN & WA. For those outside of Austin, check your local Whole Foods for availability. 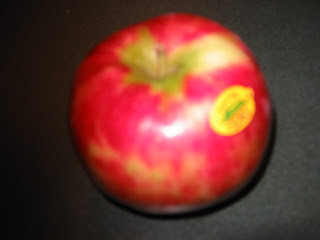 Simply the most fabulous apple you can find.